As Manager of Blick Studios overseeing the creative development of the studio, can you share some of the latest news and ongoing projects? Having been involved in the first Belfast Design Week, we’re in the middle of programming for the next event in November later this year. We’ve lots of ongoing network and pitch events, and we run an incubation programme. We’re also working on some design pop up shops—which is a new thing for us to try—as we look at how we can broaden not only working with digital creatives, but more traditional designers, makers and the wider creative community by providing physical makerspaces to broaden the creative community. We opened a studio, Eighty81 in Derry last summer, so we’re working on getting our name out there and trying to build our network. Derry has a really good energy since the year it was The European City of Culture in 2013 and it managed to change a lot of people’s opinion, though it still has a long way to go. I suppose it feels a little bit like what Belfast felt like eight years ago. People are starting to come back to Derry and there’s always been a creative legacy there in arts, theatre and music. Though business is what the city has struggled more with. It’s quite hard to run a business in Derry—you have to look outside of the city as it’s too small to make enough money there alone. With the digital era, people are coming back and working remotely, but reaching globally, which is great. There’s good energy and there are people wanting to do things, though it feels like it’s just the start of it as a work in progress. You were a participant practitioner at Creative Hub Making earlier this month in Ho Chi Minh City, an event aimed at bringing together ideas for lasting networks and future community building in East Asia. Can you share your experience of the event. Yes, British Council invited me to the event to share Blick Studios as a case study and be involved with the workshops. 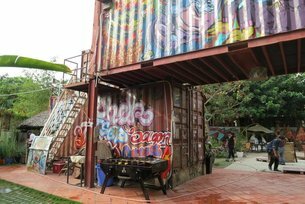 The most interesting part for me was the broad spectrum of creative hubs in Vietnam. There are art spaces, designer-maker spaces, galleries and collectives, as well as digital co-working spaces. It was good to see how the creatives all work together there and have similar aims, objectives and problems in terms of sustainability and building community. There’s common themes and opportunities for collaborations between the different industries, rather than having only groups of IT guys working together. Did you draw any parallels between the politically or cultural challenges in Ho Chi Minh City with those you’ve experienced in Belfast and Derry? I can understand that definitely with the arts scene there are a lot of censorship issues in Vietnam. The same probably doesn’t affect us so much in Belfast, but I can see how it would for people working in the fine art scene. For example a play was stopped from being shown here a couple of years ago, because of the anti-Christian message in it. What is really interesting in is how positive people are in Ho Chi Minh City—as a post-conflict area—compared to some areas of Northern Ireland. There is a high number of young people there who are enthusiastic to really work together. Obviously, it’s harder as an outsider there for a few days only hearing the positive bits, but from what I saw of attitudes there they really think they can change and achieve things. Here, we are a bit more resigned to having the same old people in power and a bit lackadaisical in trying to change the system. As a member of the Hubs Steering Group, British Council’s informal steering network of UK and European hubs, what do you think you bring to the group that’s a little bit different? I think what we can bring is a point of view that’s outside of London, and how to make something sustainable that’s in a geographically smaller location. For example, we don’t even try to do hot desking here as there aren’t enough people travelling in to work. We have to look at different ways of being financially sustainable, as you don’t have the same volume as bigger cities. How we operate in Belfast is privately funded. Our Derry studio is too, though on a government contract. So we look at different business models and ways that people can work with government—not only connected to funding—but with a contract that still allows the freedom and independence to do your work without total reliance on funding. We’ve also been going a bit longer than some of the other businesses involved in the Steering Group having started eight years ago, meaning we can bring that experience. What insights and knowledge have you taken from being part of the Steering Group? Though the group and at Vietnam Hub Making, I’ve learned a lot about what Donna Holford-Lovell is doing at Fleet Collective in Dundee. Giving freelancers the opportunity of bigger projects that they would never hope of winning a bid for is great. Pulling all of those talents together and competing with, for example, a big advertising agency is really interesting. We’re always toyed with how you would operate that kind of model, but yet to work out how we would administrate and do it successfully. It’s a good business model and way of bringing people together to collaborate. When people work together they build proper relationships. Hearing new and fresh ideas from other members of the group and how they are doing things differently is really interesting. You can be caught up in your day-to-day role, the practicalities of managing buildings and spaces, that you don’t have much time to think creatively. It’s really useful to know how things can be done differently, taking the time out to think what you could be doing better.